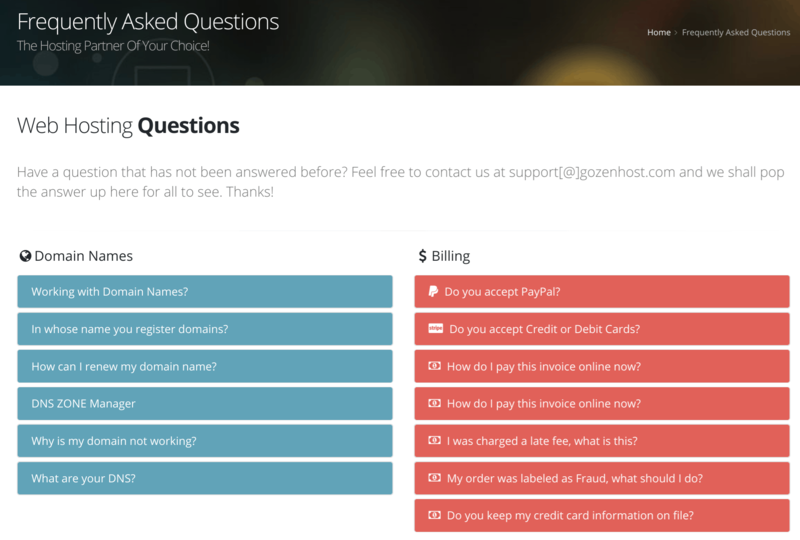 GoZENHost Review 2019: Is GoZENHost a Good Hosting? GOZEN Host was formed from the merger of two successful web hosting companies. It offers a range of hosting solutions with a great 99.99% uptime guarantee and an amazing 90-day money-back guarantee. GOZEN Host is based in America and has an English language website, but it has data center facilities in Europe as well as the U.S.A. Formed from the teaming up of web companies PacsM and No9WebDesign in 2008, GOZEN’s vision is to provide the highest quality hosting at the most affordable prices. This vendor offers a wide range of hosting products including small business hosting, enterprise shared hosting, and VPS/dedicated servers. It’s easy to manage your hosting using the cPanel control panel, and the free Site Builder should simplify the creation of an online presence for almost anyone. Support for a range of developer tools should please even the most technical users. Although there is plenty of bandwidth, the storage limits are a bit low for business hosting, and the Elastic Sites package is not as attractively priced. The 99.99% uptime guarantee should give you confidence that you’ll be hosted on a highly stable and available hosting platform. In part, this may be due to the security features that include hardware firewalls, DDoS protection, and DV SSL certificates. The superb hardware also makes use of state-of-the-art technology including RAID-1 SSDs for performance and redundancy, and the use of CloudLinux with CageFS helps to isolate you from the effects of other hosted users. With data centers in both the U.S. and Europe, the CloudFlare CDN for free, and a premium Tier-1 network, superior performance is pretty much assured. GOZEN Host provides a pretty straightforward set of three shared cPanel hosting products in the form of its Business Hosting plans that are priced around the industry average. You can also get less expensive but more limited plans for nonprofits such as charities and NGOs. Although there is no free domain, you do get free cPanel, free SSL, DNS management and a dedicated IP. As I’ve already alluded, the bandwidth is generous whereas the storage is low. You can be billed on a monthly, quarterly, semi-annual, or annual basis, and longer billing terms afford you discounts of 5% to 15%. GOZEN’s 90-day money-back guarantee extends as far as refunding any unused portion of your pre-paid hosting. You can reach GOZEN’s 24/7 technical support team via email/tickets, telephone, live chat, or even Skype. You should get rapid responses from the superior support team if you’re a fully signed-up customer signed into your control panel. However, in my experience, the pre-sales support team can sometimes be missing in action. In almost all respects, GOZEN Host is a good option for any business, big or small. It would only take higher storage limits and free domains to take this hosting vendor from good to great. For web hosting with a 99.99% uptime guarantee, go to GOZEN Host! Wondering how GoZENHost stacks up against other Web Hosting companies? Enter any other Web Hosting company and we will give you a side-by-side comparison.